Patricia Highsmith conceived her 1952, Manhattan-set story of forbidden love The Price of Salt in a paranoid political climate, when sexism was rife and homosexuality shunned. When the paperback was released she started to receive mail from men and women who felt an affinity with her rich characters and their struggle to find a place in society. Director Todd Haynes (Far from Heaven) exquisitely transfers those feelings of guilt, attraction and confusion into an achingly beautiful, tightly wound package of woe that slowly comes undone over the course of its running time to reveal something very special indeed. When young department store clerk and aspiring photographer Therese (Rooney Mara) spots a sophisticated older woman named Carol (Cate Blanchett) across the aisle over the busy Christmas period she feels giddy but isn’t quite sure why. The two strike up a slow-burning romance, meeting for brief encounters in the city before they head off on a road trip of discovery, laced with a growing menace. 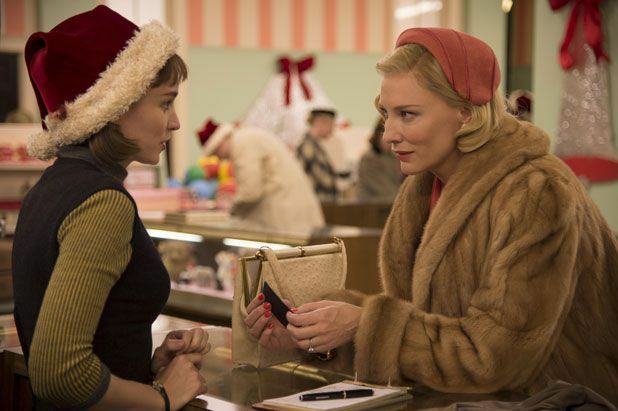 Blanchett’s mighty performance as the glamorous Carol may just break you. As the weight of a bitter divorce and custody battle over her daughter Rindy starts to consume her, she wavers delicately between powerful and fragile, threatening to topple at any moment. Mara complements Blanchett’s assured performance nailing Therese’s gradual sexual awakening and maturation. The essence of Highsmith’s text is still intact, with screenwriter Phyllis Nagy adding necessary structural changes and making small alterations. The melodrama too is perfectly judged and Edward Lachman’s cinematography charges it all with a glistening, wintry precision that turns feverish at points. And the enticing score from Carter Burwell swells to perfection in the final throes. Haynes has crafted a breathtaking study of lesbian romance and towering female strength in the face of gruelling adversity. His camera navigates and listens outside half-closed doors, teeters between physical barriers and rests on striking Edward Hopper-esque vistas. This is exceptional filmmaking.